Thanks to multiple reports we now know that the Target Exclusive Silver Knight Optimus Prime & Grimlock 2 pack is being sighted at Target stores across the country. The price appears to be a very inexpensive $16.99. 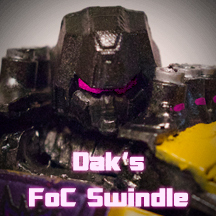 16 bucks for FoC Grimlock with a free Prime? No its silver knight prime with a free g1 coloured voyager Grimlock. I picked up 2 today for a buddy and myself. I know where I will be going at lunch time..
TF Collection: My complete list of transformers, ones highlighted are definately up for trade, other may trade depending on what traded for. So aer these Voyager or deluxes classes? Last edited by thatVWandTFguy; 08-13-2014 at 10:38 AM. yup, definitely a price snafu at Target, which will probably get corrected. Grimlock is a voyager, and prime is a deluxe... and they are incredible! Very surprised at the price, pickup one up anyways.